Original WWI grouping to a veteran of the 332nd Infantry. Grouping includes bullion patch which has moth damage, Service stripes and three reunion medals. Included is a neat poster-like picture which has been removed from a frame. The 332nd Infantry Regiment is the only American unit to serve in Italy and has a highly desirable and valuable patch. 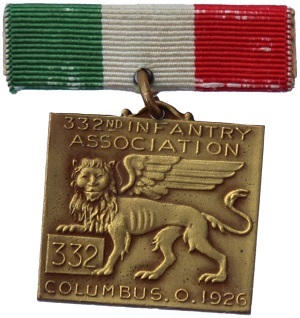 The 332nd insignia was perhaps the most envied in the entire American Expeditionary Force. It was selected to reflect their unique service in Italy. It consisted of a beautifully bullion embroidered winged Lion of St. Mark with one paw resting on an open Bible with the numbers "332" inscribed. Bullion patches incorporate metallic thread (gold or silver) for designs or to highlight or outline designs formed by other construction methods. Due to difficulty of manufacture they were usually done overseas in tailors or craft shops. 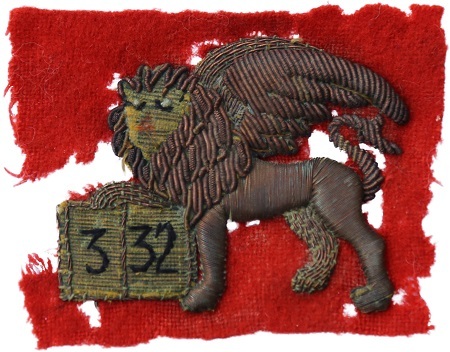 This patch was found on a returning 332nd Infantry uniform, it has a thin red wool background with some moth damage but all heavy gold bullion embroidered details are intact. Service and wound chevrons were authorized in 1917 for soldiers in the AEF to display lengths of service and wounds received while overseas. Wound and service chevrons were one in the same, the only way to distinguish between the two was according to wich sleeve they were worn on. The chevrons were a gold material or bullion sewn onto a wool background. The wound chevron was to be sewn roughly four inches above the right cuff. A wound chevron was issued each time a soldier was wounded in combat or found to be victim of a gas attack. The Service chevron indicated six months of overseas service, and worn four inches above the left cuff. 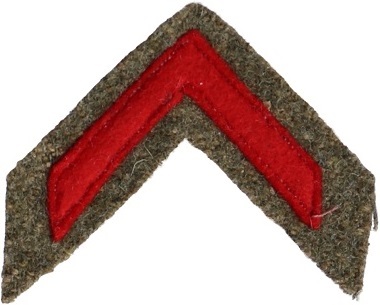 The maximum number of service chevrons that a soldier could have acquired while serving in Europe was four. The wound and service chevrons would have been worn point down on the tunic sleeve. A soldier that served less than six months overseas would have been authorized to wear a smaller light blue chevron on the left sleeve. This chevron was to be worn point up. 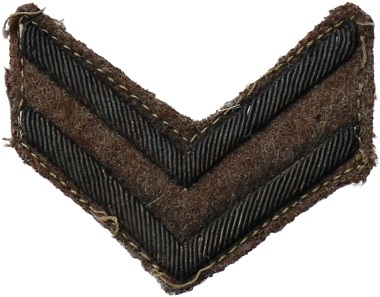 A silver chevron was authorized for six months of home service and was to be worn above the left cuff. A single red chevron was authorized for wear on or above the right sleeve elbow. This was the red discharge chevron issued to all soldiers mustering out of service. The discharge chevron would have been worn point up. Soldiers were authorized to wear their uniforms for a limited number of days following their discharge. This chevron has a gold color and is made of a metallic ribbon. They could be worn to represent wounds or six months of overseas service. This chevron has a bronze color and is bullion made. They could be worn to represent wounds or one year of overseas service. These are most likely custom made for the service men while they were on occupation duty after the Armistice.